The Common Amplifier Format (CAF) is a report for presenting a set of specifications and measured performance metrics of audio power amplifiers. While much of this information can be found on manufacturer’s specification sheets, each manufacturer presents the information differently. In addition, the methods used to test the amplifier may be undocumented or vague, making it impossible to do meaningful comparisons between various makes and models. The CAF provides a structured, consistent and well-documented report of an amplifier’s performance. 1. Provide the performance metrics needed to select and deploy an amplifier in a concise, well-defined and defensible format. 2. Provide performance metrics in a manner that facilitates apples vs. apples comparisons between makes and models. 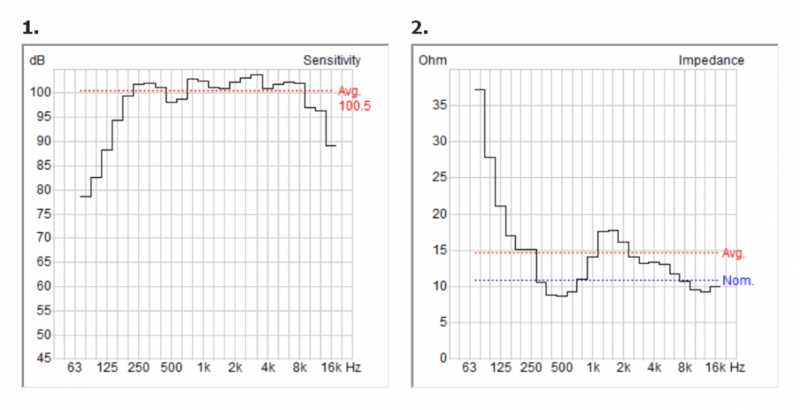 There are many ways to measure amplifiers and specify their performance. Many amplifier manufacturers have excellent specification sheets available to the system designer. Even if the CAF simply replicated this information, it adds depth and formalizes the presentation, freeing the user from having to decipher these often cryptic spec sheets. No set of specifications can replace the listening process for evaluating an amplifier, or comparing amplifiers. If you want to know how two amplifiers compare in reproducing an intense kick drum signal into a 2 ohm subwoofer, you should hook them up and conduct proper A/B listening tests. The CAF can serve as a front end for this exercise, or as a back end. It bridges the gap between artistic evaluation and technical deployment. Both are vital to the sound system design process. An amplifier can be designed and measured as though it will only drive a simple resistive load. In actual use it must drive a complex, reactive, electro-acoustic system. This affects one’s philosophy with regard to amplifier loading. It’s not just about “getting the most watts.” The prime directive is achieving fidelity when converting the electrical signal into an acoustic one. This means preserving the voltage characteristic of the waveform by making the amplifier immune to the loudspeaker’s impedance curve. When it comes to power amps, ther are important differences between heating resistors and driving loudspeakers. With the former, the objective is power transfer. With the latter, the objective is waveform preservation. Audio “power” amplifier is a bit of a misnomer. It’s not amplifying power. In reality it is producing a higher voltage facsimile of the input voltage waveform, with sufficient current to meet the demands of the load impedance. The amplifier/loudspeaker interface is optimized for voltage transfer, and all of the measurements included in the CAF are made with a voltmeter, albeit a very capable one. The amplifier’s output voltage can be tested open circuit (no load) or into any load resistance. The manufacturer determines the supported load resistances. If the resistance gets too low, the amplifier may current limit and its voltage may drop, making it non-linear in response. A 5-part video series that describes this in more detail can be found here. The importance of understanding the principles of a voltage transfer interface cannot be over-stated. All signal processes are voltage modifiers. This includes graphic equalizers, parametric equalizers, and IIR and FIR digital filters. Voltage changes made by these devices translate directly to the frequency response of the loudspeaker, and are independent of the loudspeaker’s impedance curve. As such, as goes the voltage, so goes the sound pressure level from the loudspeaker. SPL calculations should always be performed using the RMS voltage of the signal from the amplifier. The voltage power matrix of the CAF is built on this principle. The CAF requires the use of three signal types for testing the amplifier. A burst test reveals the voltage amplitude capabilities of the amplifier without requiring that it source much current. A continuous sine test reveals the current production capabilities of the amplifier under load. It’s a torture test! The pink noise test reveals the performance of the amplifier at approximates 1/8 power, which is typical for slightly clipped or compressed music or speech program material. Without all three tests, amplifiers that are quite different can look very similar. A distortion measurement basically describes the difference between the amplifier’s input and output signal. If they are the same, other than the voltage gain, then there is no distortion. There are several distortion types, including Total Harmonic Distortion (THD) and Intermodulation Distortion (IMD). Volumes have been written on both. There exists no universally accepted criteria for the amount of distortion that can be tolerated, but all agree that it should be very low. It’s easy to get bogged down with regard to the amount of “allowable” distortion. Modern amplifiers can have very low distortion ratings. For the purpose of establishing rated power, the most appropriate distortion analyzer is human vision, aided by an oscilloscope. Distortion becomes obvious when the waveform is a sine wave. Visual deformation tends to correlate with 1% THD. The nature of THD is that it drops VERY rapidly as the signal is reduced, so if the amplifier is turned down only 0.5 dB the THD probably drops significantly. Rather than get mired in distortion specsmanship, the CAF ratings are based on 1% THD. If this is not attainable then the actual distortion must indicated in the provide notes fields. So, the CAF philosophy is that 1% THD is low enough for measuring the amplifier’s output voltage for the purpose of establishing the amplifier’s rated power, which is in turn de-rated by the crest factor of the program material for SPL calculations. The manufacturer’s data sheet can be consulted in cases where more information on the distortion performance is desired. There’s no need to use a microscope when a magnifying glass will do. 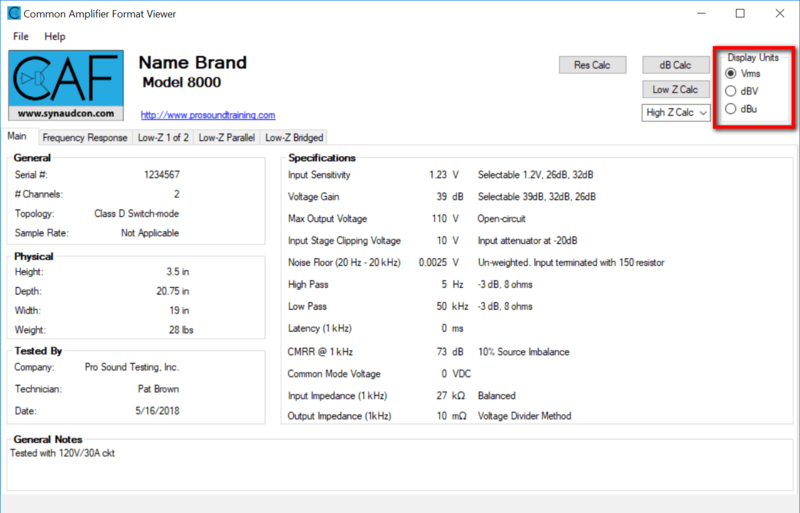 There are several choices for specifying the voltage and power levels produced by audio products. Voltage is commonly expressed in dBV or dBu. Power is expressed in dBW or dBm. All voltages in the CAF are root-mean-square unless otherwise indicated (Vrms). In the CAF, the abbreviation for voltage is E (electro-motive force) and the symbol is V.
There is no universal agreement on which of these should be used to present the amplifier’s specifications. That’s why CAFViewer allows the user to select, providing radio buttons to choose between Vrms, dBV, and dBu. Figure 1 – Voltages can be displayed as Vrms, dBV, or dBu. The CAF is divided into three major sections, organized by tabs. The number of tabs grows dynamically depending on the amplifier, but more about that later. Here is an overview of each. 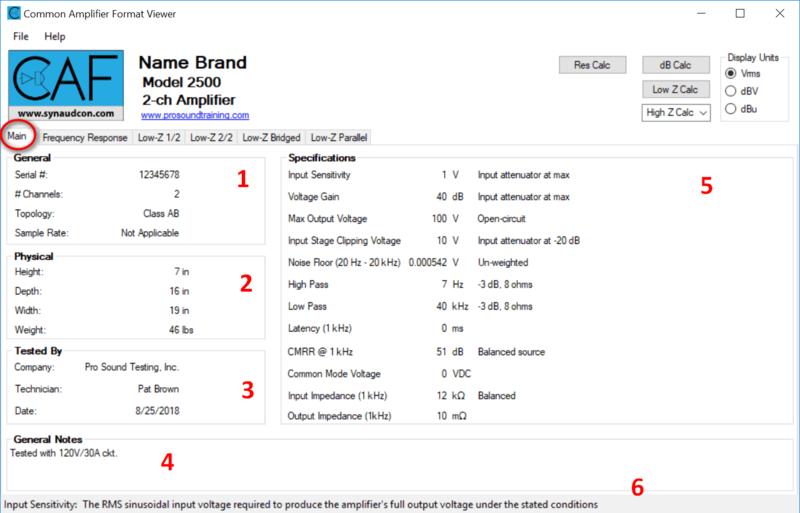 This “home” page of CAFViewer gives information on the general characteristics of the amplifier, including some “one number” performance metrics. Please refer to this graphic for a description of each. These are general characteristics of the amplifier as provided by the manufacturer, including the serial number of the unit tested. The amplifier topology is given, along with the sample rate (for digital devices). These are physical characteristics of the amplifier as provided by the manufacturer. This is the party that performed the testing, along with the date. Additional information that does not conform to the other sections can be included here. These are “one number” metrics used to summarize a characteristic of the amplifier. Each is explained in a section below. This section shows information about the various ratings, plots, etc. throughout the entire calculator. All amplifiers are 20 Hz – 20 kHz, right? Not so! Amplifiers designed to drive transformer distribution systems often have an intentional low frequency roll off. Subwoofer amplifiers are band-limited, and often include an equalization curve. An amplifier’s frequency response may change with drive level. To remove any doubts the Frequency Response Tab displays the transfer function of the amplifier. This plot is produced by feeding the amplifier a log sweep at its full input sensitivity. Note that the Y axis can be scaled in Vrms, dBV, or dBu. The load resistance and THD for the full voltage sweep is listed in the Notes section. Same as 1, but with the drive level reduced by 3 dB. Some amplifiers exhibit a significant response change between the full and -3 dB sweeps. This plot displays the results of Don Keele’s Peak Tone Burst test. It displays the measured peak output voltage of the amplifier on 1/1-octave centers. These are the only peak voltages in the CAF, and they are measured, not calculated. A complete transfer function contains both magnitude and phase information. The phase response plot is produced from the same sweep as the Full Voltage response. For critical applications the phase response at the frequency extremes may need to be considered, since high pass and low pass filters are required to band limit the amplifier. Please note that it can be toggled off if desired. Selecting this displays the frequency response using the IEC 60268-5 Standard. This prevents “over-smoothing” of the frequency response by using an excessive range on the Y-axis, which can make an amplifier or loudspeaker appear “flatter” than it actually is. EC 60263 (graph aspect ratio) is a normative reference in IEC 60268-5 (loudspeakers), and has been for over 30 years. It’s actually normative throughout all of the 60268 series in IEC TC-100 as well as all of the standards in IEC TC-29 (hearing aids, measurement microphones, etc.). It is also a normative reference in the new IEC 60268-21 and draft IEC 60268-22 revisions/updates of IEC 60268-5 that our working group chaired by Wolfgang Klippel is working on. (Of course, that alone is no assurance that anyone will actually follow it…). This is an information dissemination / education problem: The vast majority of technical people working in this area are completely unaware of the IEC 60263 standard, which has been around a very long time and dates to the period of level recorders where the size of the recording paper fixed the aspect ratio, and not surprisingly, came in 3 sizes, corresponding to the 10, 25, and 50 dB per decade aspect ratios. You can see this ‘violation’ in many JAES papers as well. One has to force this manually in MS Excel, the latest versions of which also have a bug in the log x axis routine (selecting 20 Hz as the starting frequency puts all of the grid lines in multiples of 2 even if a base of 10 is selected…). It’s a wide-spread problem. The heart of the CAF is the voltage/power input output matrix. Each operating mode of the amplifier gets a tab. Modes are defined by whether or not a hardware or software switch is selected to change the amplifier’s behavior. In short, if you have to throw a switch it’s now a different amplifier, and it gets its own tab. The number of tabs grows dynamically depending on the amplifier, and some amps have many! There are two amplifier types used in audio. If the tab says “Low-Z” then the amplifier connects directly to a loudspeaker with a low impedance value, such as 8 ohms. If the tab says “High-Z” then the amplifier connects to a loudspeaker(s) through a step-down transformer. This transformer is usually packaged with the loudspeaker. We’re now ready to have a look at the first section of the I/O matrix. This example uses a Low-Z tab, and you can see the supported resistances in column 3. 1 – Stimulus Type – The CAF requires that the amplifier be tested with 3 stimulus types. First on the list is a burst test. There is flexibility on the details of the burst, but CEA-2006 serves as a good guideline. A 1 kHz 10 cycle full-scale burst is interleaved with 480 cycles at -20 dB. This test is highlighted in green because most amplifiers use the results to establish the amplifier’s rated power. 2 – Crest Factor – This is the peak-to-RMS ratio of the stimulus. The higher the crest factor, the lower the power that the amplifier must produce. 3 – Load Resistance – A resistive load, with an adequate power rating and cooling to handle the amplifier’s output signal. The manufacturer determines the lowest resistance for testing the amplifier. 4 – Input Voltage – The voltage applied to the amplifier input to produce its output voltage. This should be in close agreement with the input sensitivity specification on the main page. If the amplifier fails to maintain its full output voltage as the load resistance is decreased, the input voltage is reduced and the test repeated. 5 – Output Voltage – The RMS voltage of the full-scale burst segment is analyzed to determine the amplifier’s output voltage. The -20 dB segment has little effect on the results, but keeps some amplifiers from going into sleep mode. The test is repeated at 50 Hz, with 10 cycles full-scale and 20 cycles at -20 dB. 6 – Loading Effect – The top entry in column 5 becomes the 0 dB reference in column 6. Each additional entry in column 5 is compared to the topmost value, and the difference in dB is displayed in column 6. So, if the amplifier produces the same output voltage into all loads, column 6 would be all zeros. If the voltage in column 5 drops below the topmost value, the level drop is indicated in column 6. Significant changes (> 1 dB) in this column indicate that the amplifier is current limiting (an undesirable behavior). 7 – Rated Power – This is the power rating given the amplifier by the manufacturer. 8 – Measured Power – This is the power calculated by squaring column 5 and dividing by column 3. The measured power should equal or exceed the rated power. 9 – Measured dBW – This is column 8 expressed in dB relative to 1 watt. It is useful for evaluating the power difference into the various load resistances. The analyzer monitors the THD as the drive level is increased and stops the test when the target THD value has been reached. The amplifier is tested at each rated load resistance. The EIn determined from this test is used as the starting input voltage for the continuous sine wave test. The next section of the I/O matrix reveals the results of the continuous sine test. Until recently, virtually all amplifier testing was done with continuous sine waves. With a 3 dB crest factor, it is the electrical equivalent of a mechanical drop test, essentially torturing the amplifier. There exists no universal agreement on the length of the test, but the CAF recommends at least 15 seconds. Shorter spans don’t reveal the robustness of the power supply design, and longer spans are foreign to how amplifiers are typically used. As always, a compromise is required. The manufacturer is free to use a longer span, and can indicate it in the matrix. The time span and %THD are indicated in the stimulus section. The CAF philosophy on allowable THD can be found here. The test requires that the amplifier maintain the same amplitude over the time span. If the voltage drops during the test, the test is aborted and after an appropriate wait it is repeated with a 1 dB lower level drive signal. This is why the matrix includes both the input and output voltage. The input voltage that produces the sustainable output voltage becomes the amplifier sensitivity for that particular test. Of course an ideal amplifier would not require reducing the drive voltage to make it hold the sine wave, and the input sensitivity would be independent of signal type. Some additional columns are added to the matrix. They are described below. 10 – Amps – This is the current drawn from the utility power circuit during the test. It provides a guideline for the selection of the circuit breaker for the amplifier, representing a worst-case scenario with regard to power draw. 11 – Watts – This is the power drawn from the utility power circuit during the test. Note that audio power (column 8) will always be less than column 11, unless you’ve figured out a way to the amplifier to create power. If so let’s talk. I’ll invest. 12 – Power Factor – A DC source has a power factor of 1. AC sources have a power factor of less than 1. If the amplifier incorporates power factor correction, it will show up here. 13 – BTU/hr – This is the heat output of the amplifier, useful for designing a cooling system. Since it is for a sine wave stimulus, it represents the worst case scenario. It can be de-rated as desired. See the next section on Pink Noise stimulus. For our international friends, BTU/hr can be converted to kCal/hr by multiplying by o.25. I originally included it but needed to save space. 14 – Any special notes regarding test conditions, nuances, special setups, etc. can be listed below the matrix. The matrix reveals that the burst power is typically higher than the continuous sine power. Actually the opposite is true, since the burst output considers only 20 ms (1 kHz). A system cannot output more power than it draws. A true comparison of the power generation of bursts vs. sines would require evaluation over the same time span. Marketing forces have adopted the unit of “power” to describe the burst test results, but a burst test doesn’t produce much power. Ironic, isn’t it? This is one (of many) reasons that SPL calculations should be done with voltage, not power. NR in the Rated Watts column indicates that the amplifier is not rated by the manufacturer for this stimulus. NR is not permitted for the 1 kHz Sine Burst stimulus. The pink noise results usually best represent how most amplifiers are actually used. The signal is broad band, and the crest factor is 12 dB. This produces about 1/8 the audio power of a sine wave. To better simulate music and speech program, the noise may be shaped (e.g. IEC-268-1 noise) and the crest factor limited to 6 dB (50332 noise). This can prevent the activation of limit circuits within the amplifier, which can prevent the amplifier from reaching “1/8 power.” The amplifier is operating far below its full power output, just coasting when compared to a sine wave. 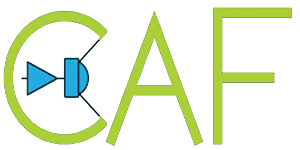 The CAF allows any noise type to be used, so long as it is specified in the matrix. As you can see, the current draw is much lower than that of a sine wave. This represents a good lower limit for sizing circuit breakers and cooling systems. The power draw and BTU output for the amplifier at idle is also included in the matrix. Note that the voltage field will usually indicate “0 Vrms” but if you select dBu or dBV you will see a very low level, an excellent example of why we prefer to work in dB. Additional lines may be included if the amplifier has a “green” mode, etc. If the tab says “High-Z” then the amplifier is designed to drive loudspeakers that incorporate step-down transformers. A High-Z tab is essentially the same as a Low-Z tab with regard to most measures, but you will notice the output voltage is a standard value used in distribution systems, such as 70 V or 100 V. You will also notice that the Load R (column 15) is typically higher than for Low-Z amplifiers. In principle High-Z distribution works the same as Low-Z distribution, except the circuit values (E Out and Load R) are scaled to higher values. This provides several benefits and one drawback. Benefit – The higher load resistance permits the use of smaller diameter cable. Benefit – Multiple loudspeakers can be daisy-chained onto a single amplifier, with the volume of each selected at the loudspeaker by a “power tap” such as 1 W, 2 W, 4 W, etc. Drawback – The reactive properties of the step-down transformer may limit the low frequency response when compared to a Low-Z interface. These systems are typically designed by making sure that the sum of the loudspeaker power taps placed on the line does not exceed the amplifier’s rated power. Easy enough. For this reason, many high-Z amplifiers only give the distribution voltage and rated power. The CAF takes it a step further, showing the minimum load impedance that the amplifier can drive at its distribution voltage (column 15). This benefits the designer that must deploy an amplifier into an existing system where the number and location of loudspeakers is not known. An impedance measurement of the line reveals the load that the amplifier must be able to drive, and summing the power taps is unnecessary. For a fuller description of High-Z distribution, see the section on the High-Z calculator. CAFViewer includes calculators for both low-Z and high-Z distribution systems. Their operation is described below. Section 1: Amplifier – The amplifier signal is specified in RMS volts. In CAFViewer all SPL calculations are based on voltage. 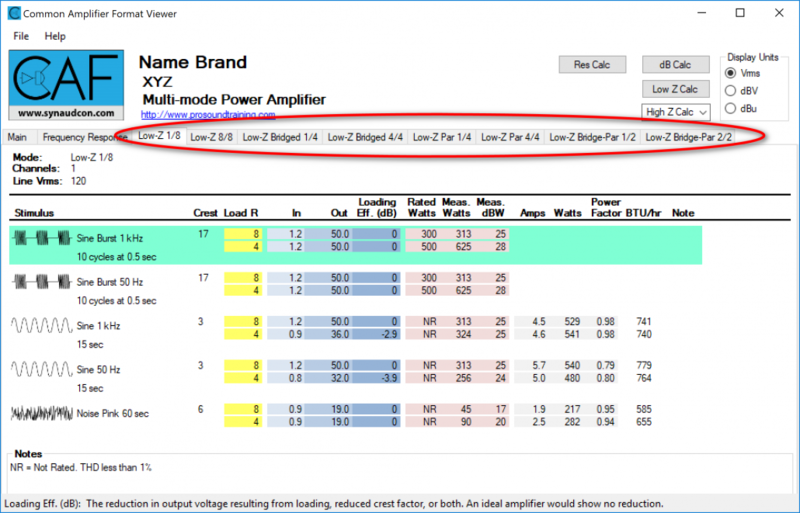 If you only know your amplifier’s watts rating, you can vary the voltage (try the mouse wheel!) until the approximate watts rating is shown (98 watts in the above example). Yes, this seems strange at first, but it promotes correct thinking about how amplifiers work. The crest factor defaults to 3 dB (sine wave). It should be increased to describe the program material you intend to feed the amplifier. The RMS voltage post crest factor is shown (28 Vrms in Fig. 10). The SPL calculation will use this voltage. Section 2: Loudspeaker – The loudspeaker’s rated sensitivity is entered here. It should be provided by the manufacturer or can be read from the CLF data file. This is normally the average sensitivity – a one number rating for a flat line drawn through the sensitivity plot. That’s it! 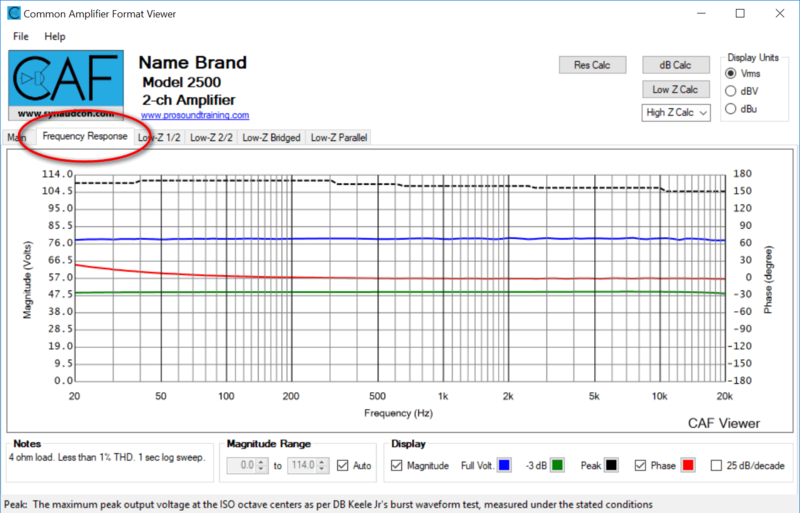 The rated power and impedance do not affect the SPL calculation. Loudspeaker “Power handling” – A loudspeaker has a thermal limit on its operation. It is determined by measuring the maximum RMS voltage that the loudspeaker can handle for a specified time span for a specified type of program material. This Emax voltage is often presented as a power rating. CAFViewer can calculate the Emax from the power rating. The Vrms from the amplifier (post crest factor) should never exceed the Max. Capability shown in this section. Section 3: Listener Distance – The listener distance is entered in feet or meters. The calculator assumes inverse-square law level change with distance (-6 dB per double distance). This is the behavior of a “point source” – a device that emits spherical sound waves when observed from the far field. Section 4: Calculated SPL – The SPL is calculated and indicated on this scale. The RMS SPL is the primary result. The A-weighted level assumes that the stimulus is pink noise. The peak SPL is given because it gets a lot of press. The appropriate levels for various system types are shown above the scale (A-weighted). Section 5: Wire Gauge – The required wire gauged based on the cable length and loudspeaker impedance is given here. Enter the appropriate impedance in Section 2. The CAF follows the 5% rule, where the allowable wire resistance should not exceed 5% of the loudspeaker’s impedance. This represents a line loss 0.5 dB. The High-Z calculator is a modified version of the Low-Z calculator. The are two important differences (Figure 12). The amplifier voltage defaults to a standard distribution voltage (e.g., 25 V, 70 V, 100 V, etc.). The signal chain includes a step-down transformer. All other calculations are the same as the Low-Z calculator. There’s an important lesson in that fact. Low-Z and High-Z distribution systems are very similar in operation. The difference is that a High-Z system starts with a rated distribution voltage, which is scaled to a lower voltage by the step-down transformer. Loudspeakers for these systems typically have user-selectable “power taps” on the loudspeaker itself. The values imprinted on the loudspeaker are based on an assumed distribution voltage (e.g., 70 Vrms) and crest factor (3 dB) and the action of the step-down transformer. The High-Z calculator displays the turns ratio of the transformer, based on the power tap entry. While one doesn’t necessarily need to know the turns ratio, we include it for academic reasons. Note that the transformer dramatically increases the impedance of the loudspeaker as seen by the amplifier, while at the same time stepping down the amplifier voltage delivered to the loudspeaker. It’s a two-way street. Since the loudspeaker now has a higher impedance, multiples can be paralleled onto a single amplifier. The Qty field allows you to select the number of loudspeakers. The total impedance of the line is shown, along with the total of the power taps, which is displayed under the amplifier graphic. Make sure your amplifier can source more power than what is drawn by the zone of loudspeakers. Note that with the higher impedance values, a small wire gauge can often be used. CAFViewer calculates the wire gauge based on the total impedance of the zone. This is the input voltage required to drive the amplifier to its full output voltage, into the indicated load impedance (typically 8 ohms). It is provided by the manufacturer, and verified by measurement. The input attenuator is typically at its maximum setting. Voltage gain is dependent on the setting of the input sensitivity control. Voltage gain tends to be independent of the drive level to the amplifier. The voltage gain is useful when signal processors such as compressor/limiters are placed ahead of the amplifier. The amplifier can then be treated as a simple “voltage gain block” and the output voltage of the amplifier determined by the signal processor block. This can be used to protect loudspeakers from excessive peak levels, RMS levels, or both. Note: Many amplifiers have a user-selectable input sensitivity range. The manufacturer specifies which setting is used for the CAF testing. This is the maximum linear sine wave output Vrms of the amplifier at 1 kHz with no load or the indicated load. It’s what the amplifier would output if it were used to drive an electronic input such as another amplifier (through an appropriate attenuator if necessary). The “no load” output voltage of the amplifier is useful for comparing to a “under load” condition. The voltages should be the same or similar. This is the input voltage to the DUT at which the input stage of the amplifier clips. It is required because it may be possible to clip the amplifier’s input stage, prior to clipping the amplifier’s output stage. For example, if a mixer is producing +28 dBu, but the amplifier input stage clips at +12 dBu, the signal will be distorted no matter the setting of the amplifier’s gain control. For this test the input sensitivity of the DUT is set at -20 dB ref. full output to prevent the output stage from clipping. A low level 1 kHz signal is applied to the DUT and slowly increased. The output voltage is monitored on an oscilloscope for visible clipping, which terminates the test. The input voltage is then measured and recorded. This is the residual or “self-noise” of the amplifier. All electronic devices produce output noise, even without the presence of an input signal. For this test, the amplifier’s input is terminated by a low value resistance (e.g. 150 ohms) and the output voltage measured using a sensitive voltmeter. The input sensitivity should be set at maximum. If a weighting scale is used, it should be indicated in the notes field. This is the -3 dB point on the high pass portion of frequency response curve. For many amplifiers it will be below the 20 Hz – 20 kHz bandwidth shown on the Frequency Response tab. This is the -3 dB point on the low pass portion of frequency response curve. For many amplifiers it will be below the 20 Hz – 20 kHz bandwidth shown on the Frequency Response tab. The amplifier’s overall bandwidth can be determined by subtracting the high pass frequency from the low pass frequency. Latency is the inherent, unavoidable delay of a signal passing through a digital amplifier. It is found by measuring the amplifier’s impulse response (IR). The IR can be presented in the frequency domain as group delay. Note: The GD plot should be flat at the frequency at which the “one number” latency is determined. Since the GD is often frequency-dependent due to the high pass response of the amplifier, a frequency other than 1 kHz may be used, and should be indicated. For a balanced input, the output level of a common-mode input signal relative to a differential-mode input signal. This is a “one number” metric for 1 kHz. While there are several methods for measuring CMRR, the IEC 60268-3 method is recommended. This places a 10 ohm imbalance in the output driving the amplifier. Some amplifiers have a common mode DC voltage on their loudspeaker output terminals. The loudspeaker doesn’t see it because it is connected in differential mode. For such amplifiers it is IMPORTANT to not ground either output terminal. The load impedance (electrical) presented to a source (e.g. mixer, DSP) by the input stage of the amplifier. It is of interest when the system design calls for multiple amplifier inputs to be driven from a single output. Typical values are 5kΩ and higher. The output impedance of the amplifier is the source impedance seen by the load (such as a loudspeaker), neglecting the resistance of the interconnecting cable. Why is this here? In the case of power amplifiers it is typically extremely low and has no real effect on the voltage delivered to the load. It is more traditional to specify a “damping factor” for an amplifier, which is the ratio of the load resistance to the amplifier’s output impedance, with a higher number being “better.” But, this is an abused specification that is no longer taken seriously by most engineers, since the amplifier’s output impedance is swamped out by other resistance values in the circuit such as the wire resistance and the loudspeaker’s voice coil resistance. So, be very careful with damping factor. But, it is good that the amplifier has a very low output impedance, and the 1 kHz value is given here.